In one of my previous blog post, Identifying Worker Process (w3wp.exe) – IIS 6.0 and IIS 7.0 for Debugging ASP.NET Application – I have explained about how we can identify the list of currently running worker process using command prompt while we need to attach process from visual studio . But do you know for IIS 7.0 and IIS 7.5 we can get the worker process (w3wp.exe) details like Application Pool name, Process ID, CPU Usages from IIS Manager itself. Even you can get details of each worker process for a “Web Garden” scenarios. So when you need to attach some process for debugging from Visual studio, Instead of going to command prompt, you can easily identify the worker process Id from IIS itself. Click on the “Worker Processes” to get details of all worker process which are currently running as shown in below. So from the above list of worker processes you can get the details of Application Pool Name, Process ID, state of worker processes along with CPU uses and memory uses. From Visual studio Attach Process window you will find the same list of worker process with the same Process ID. So based on your application Pool name you can attach the process and start the debugging. What else we can have from Worker Processes lists in IIS 7 Manager? What about the current Worker Process (w3wp.exe ) State ? You must be wondering why there is no “Stopped” Status for Worker Process in IIS ? I will explorer it in a different blog post. Yeah that will be very interesting ! Very soon ! Similar like State you can also monitor CPU % Uses and Memory Uses from the IIS Itself. What about the Current Request at Worker Process ? Well, you can view the current request details for a particular worker process from IIS Manager Itself. So, When your worker process is on running mode, If you want to check the what are the thing going on backend, just double click on the particular worker process. From the request details, you can get web site id, URL, HTTP Verbs, client ID and State along with Module Name. I liked the State and Module name column very much. This two columns will let you know where is your current request and which HTTP Module is taking care of that Request. You can also read “Securely Implement Request Processing, Filtering, and Content Redirection with HTTP Pipelines in ASP.NET” to know more advance topics. Before start web garden mode, if you want to know more about Web garden or just wanted to recap please read on of my previous article What is the difference between Web Farm and Web Garden ? If You have configured your site as Web Garden, you can also get the list of all the worker process in the worker processes list with the different worker Process ID but all worker process should have a “Single Application Pool “ . So, from the above diagrams you can see, “WCFSite” has configured as Web Garden mode with Two Worker Process and from the Worker Processes list you can view both the worker process with different Worker Process Id and both of them are listed under same Application Pool. Note: You will able to see only the worker process which are in running state . 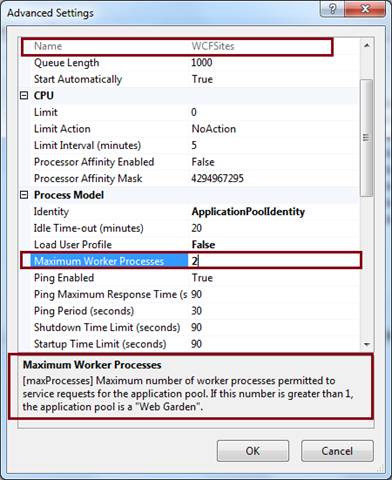 Summary : In this blog post I have explained how you can use the power of IIS Manager to get the list of worker process with there application pool id, name, Running State along with CPU and Memory Uses along with viewing the worker process request. I have also explained about how to get details of each worker process in web garden scenarios. I will publish another blog post Worker Process State very soon. Previous Entry How to pass InitParams to Silverlight Application which is hosted as SharePoint 2010 web parts? Helpful info. Fortunate me I discovered your web site accidentally, and I’m surprised why this coincidence didn’t came about earlier! I bookmarked it.